It is our intent to update this photo gallery monthly. Success over the long haul will depend on inputs from the AWRA membership. In other words, we would really like any photos you may have of Weather Reconnaissance crews and aircraft in action. Please send any digital photos to the Webmaster. If you have prints or slides to share, contact the Webmaster and we will let you know where to mail them. We can scan most formats and will quickly return the original to the owner. ► February 2008 Update -- The first (of many, we hope) monthly posts about weather reconnaissance aircraft. This month the topic is the WB-66D. It was not operated by AWS units, but still had a important role in the Cold War plans of PACAF and USAFE. Looking for folks who actually crewed the WB-66D to help us flesh out "real" story. ► January 2008 Update -- Finally an update! With big plans to get something posted every month this year, we offer a page about a long-time tradition of unit photographs. AWRA has found numerous examples from the 1940's, 1950's, and few from the 1960's. We are looking to add to the archive. Contact AWRA if you know where we can get copies of other examples. ► March 2007 Update -- AWRA is happy to announce the return of Cold Fronts, a book by former ARWO, the late Col Jack D. Sharp. An interesting tale of one man's diverse Air Weather Service career. Filled with personal stories of work and family, Cold Fronts is a great read. ► February 2007 Update -- One of the major weather reconnaissance pioneers was Paul H. Fackler. 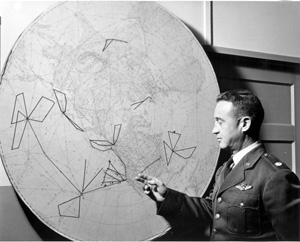 He led the weather B-29s in support of the first Post-War nuclear tests and then was the only USAF officer to hold a major position during every test for the next ten years. ► January 2007 Update -- The story of the 512th Recon Sq (VLR) Weather that was stationed in Japan from 1950 to 1951. This squadron later became the 56th SRS. ► August 2006 Update -- A tribute to the men of the "Golden Heart", WB-50D, that crashed on 31 August 1956 with the loss of all 11 souls on board. The update in three pages, so follow the links at the end of each page. ► May 2006 Update -- Many thanks to Ray Brashear and Bob Mann who sent us quite a few pictures from the WB-29 era on Guam. Ray's are especially nice, since they are in color. Follow the link to go to Page One of Ray's pictures. ► April 2006 Update -- We are posting a bit of news from the archives of the 58th WRS this month. John Priestle provided the copy of a 1951 Smilin' Jack Sunday comic. Jack was an aviator extraordinaire created by Zack Mosley in 1933. The strip ran until April 1973. This comic mentions the 500th polar flight by weather reconnaissance crews. By 1956 the number of Ptarmigan missions had reached 2000. ► March 2006 Updates -- This month we are highlighting several items that have been sent in by members and other interested parties. I feel very good about the first page, which is a 1949 Christmas Dinner program from the 373rd Reconnaissance Squadron (VLR) Weather at Kindley AFB, Bermuda. ► February 2006 Update -- An update on the painting that AWRA Life Member Larry O'Neal donated to the USAF Art Collection. ► January 2006 Update -- A long overdue tribute to the "original 55th". 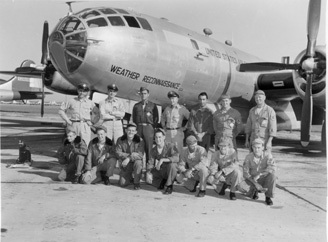 This is the 655th Bombardment Squadron, Heavy, Weather Reconnaissance, which later became the 55th Reconnaissance Squadron, Long Range, Weather. Flying B-24L and B-24M aircraft from Guam, Iwo Jima, and Okinawa during 1945 and 1946, they were the original Typhoon Chasers. ► October- November 2005 Update -- Check out these pages of photos from the 2005 Reunion held in San Antonio. There are pictures from the hospitality suite, Annual Banquet, and the AWRA Social held at the home of Bernie and Rosalind Barris. ► September 2005 Update -- This month we have a great example of what the Web Master has been asking for over the past year. Colonel Pat Hanavan, one of AWRA's Life Members, sent in a wonderful series of photos of WB-50D 49-0310. This aircraft, housed at the National Museum of the Air Force at Wright-Patterson, is the best remaining example of her kind. Combined with Official USAF photos, courtesy of the Air Force Weather History Office, we can breath a little life into the memory of the WB-50D, and the folks who flew her, maintained her, and loved her. ► Summer 2005 Update -- This link will take you to a tribute to the birds that have been used as track names and aircraft Call Signs over the years. I'm missing a few, so I ask your help. Thanks in advance. ► May 2005 Update -- This month let's pause to remember all of the men and women who have sacrificed their lives in the service of our country. Monday, May 30th is Memorial Day, but every day should be one where we remember our fallen comrades. Let's especially remember those who died while flying weather reconnaissance and atmospheric sampling missions. ► April 2005 Update -- The April update remembers the very early efforts at weather reconnaissance. ► March 2005 Update -- The March gallery is a big "Thank You!" to the folks from maintenance. The page opens in a new in a new window. ► February 2005 Update -- The February gallery is a tribute to a certain sports periodical that annually breaks up the winter doldrums with a Swimsuit issue. Follow the link above to open something new, and hopefully enjoyable, in a new window. ► January 2005 Update -- Note: This links to a new page. The subject this month is the WC-130A and the 500th "Motorpool" rain making mission in SEA. Don't miss it! ► December 2004 Update -- Christmas Drop missions flown from Guam. Note. As with most web sites, we have limited amounts of storage and monthly bandwidth. As a result, we post smaller images designed for on-line viewing on your browser. If you want a larger version of an image from any of our galleries, please send an e-mail request to the Webmaster. From the 1955 unit history of the 54th WRS. 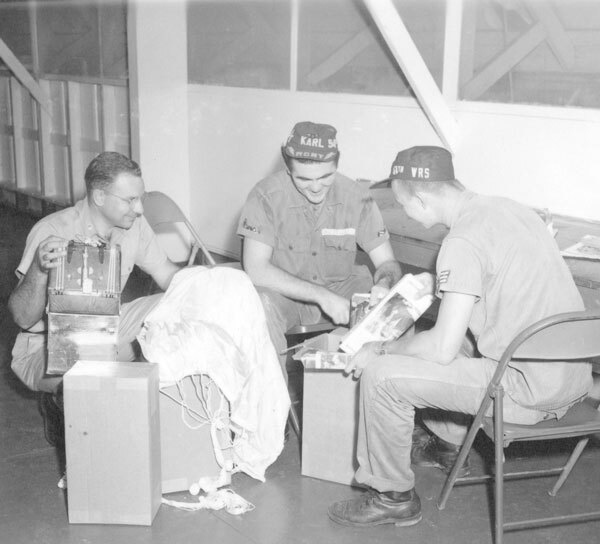 The caption reads: "Preparing for Christmas drop; (l-r) Maj Winton C. Brown, A/2c Otto Boetticher, A1c Durley Y. Lartey." In the text of that same history it says: "The annual Christmas drop, an established tradition of the 54th, was made on Christmas morning on a regular weather flight. This drop was sponsored by the Weather Section ... 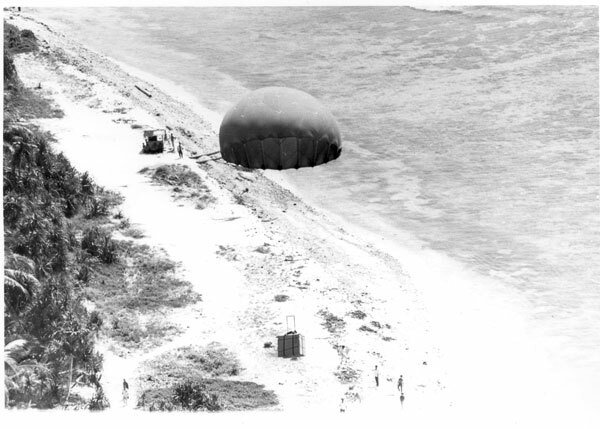 In November, magazines, books, candies, toys, etc., were collected; unserviceable dropsonde chutes had been saved during the year for that purpose and parachutes were borrowed from the Coast Guard. There were two phases to this drop. The one phase was for the natives who live on the Palau Islands; the other for the Coast Guardsmen who live in virtual Isolation for months at a time at Anguhar and Ulithi. World-wide publicity was given this project and was carried by all the news services"
AWRA wants to send a special "thank you" to Mr. Jerry White of the Air Force Weather History Office for all of his help, including this information on Christmas drop. By the late 1970's, Christmas Drop was a much larger operation. Hundreds of boxes were filled with items needed on the various islands. 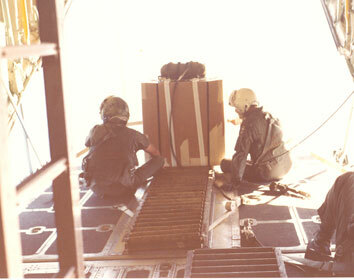 The boxes each weighed between 200 and 400 pounds, depending on what parachutes were available. 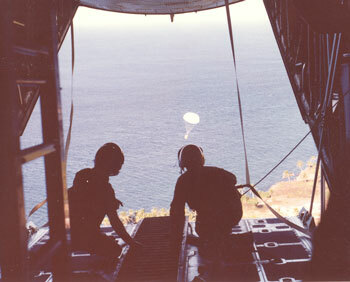 Christmas Drop used T-10 personnel chutes (pictured), cargo chutes, or chest packs. These chutes had been condemned and declared excess by the military for operational use. After being inspected by certified riggers, the 54th used them one last time to bring much happiness to island children. Drops were made individually, like the one pictured, or two or three boxes were dropped on the same pass depending on how many were going to that island. These photos taken in 1982 by Bernie Barris in the northern Marianas islands. Occasionally, the 54th was called on to help old Santa himself. 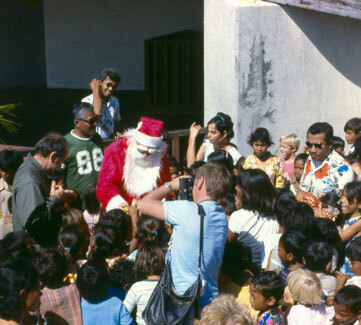 In 1978, Santa heard that Christmas Drop would be heading to the Marshall Islands. I'm not sure what the problem was with Rudolf that year, but the Jolly Elf asked for our help. 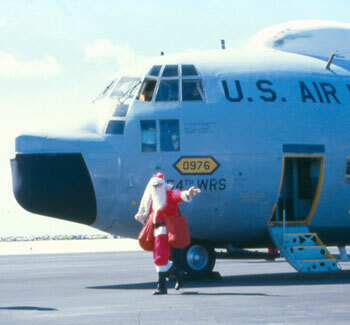 At left is an image of Santa arriving on Majuro, the Capital of the Marshall Islands by WC-130. Hundreds of children turned out to welcome him (right). These photos are scans of slides taken by Bernie Barris. It seems that one concern shared by all Christmas Drop crews was that a drop might hit someone. We always planned our run in so that if a chute failed, or if a box broke open, (rare, but it did happen) the debris would not endanger the islanders. Despite our best planning, it always seemed that people appeared out of nowhere as soon as the chute opened! Ralph Ruyle participated from WB-50's in 1958 and 1959. He recalls in an E-mail that, "the natives were waving and running around. We managed to hit the islands with our drops and miss the natives." Ralph did not take any pictures, although he says other crew members did. We would love to share photos from the WB-29 and WB-50 Christmas drops, so if you have any squirreled away, please contact the Webmaster. wishes you and yours a joyous holiday season. This will be an October - November update. Before you protest, I point out that there is also an extensive group of AWRA reunion photos added this month. Having headed off any complaints, we turn once again to the archives of the Air Force Weather Agency at Offutt AFB, NE. These photos are all official U.S. Government property and can not be sold, copyrighted, or used for commercial purpose. Any display of these pictures should credit them as "Official Air Force photograph, courtesy of Air Force Weather History Office". 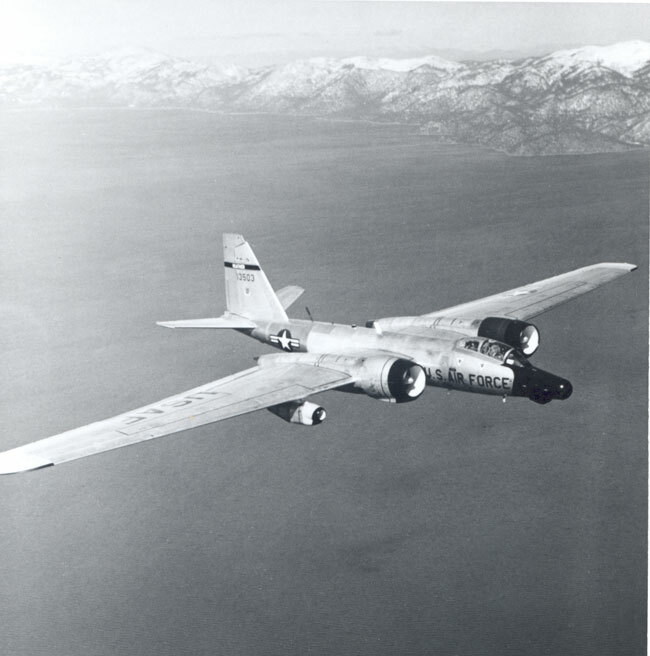 Our subject this month is the WB-57, also known as the RB-57 during its career with weather reconnaissance. This British-designed medium bomber-type saw action as a weather reconnaissance and atmospheric sampling aircraft in at least three flavors, identifed by wing length. These were the regular wing B and C-model (64 foot wing span), long-wing D-model (106 foot wing span), and VERY long-wing F-model (122.5 foot wing span). In my WC-130 days, we deployed along with the F-models on a couple of COLD SPLASH and COLD TRAP missions. I had the opportunity to ask a 58th WRS navigator what the difference was been his aircraft and a sampling equipped U-2 of the day. "Not too much", he said. "The U-2 can carry a nice 2100 pounds of mission equipment, while the WB-57F carries up to 21,000 pounds". The WB-57F had totally redesigned honeycombed skin on the flight surfaces. 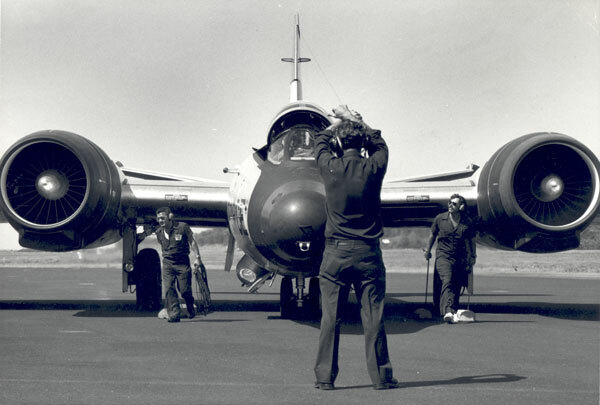 The vertical stabalizer was also almost double in size, compared to the Canberra Bomber, to provide stability (in other words, to keep the pointy end of the aircraft aimed in the direction of flight). The original J-57 engines were replaced with Pratt and Whitney TF-33 turbofans, and a Pratt and Whitney J-60 turbojet engine was slung under each wing. The resulting aircraft could carry its massive payload to altitudes above 70,000 feet and loiter for many hours. Decent was tricky, however. At high altitudes, the WB-57F (like the U-2) had a very small airspeed window (5 to 8 knots) between wing stall and "Mach tuck". Airspeed and attitude had to be closely monitored, and it took a long time to get back to traffic pattern altitude. 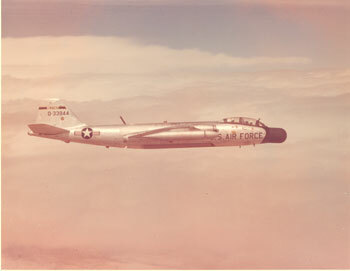 Air Weather Service flew B-57's from several locations in the 1960's and early 70's. They were stationed in Australia, Japan and the CONUS and deployed worldwide. The primary mission was particulate and gaseous atmospheric sampling in support of National Command Authority goals. 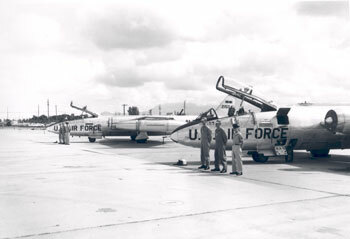 In the early 70's, the remaining Air Force WB-57F's were brought together at the 58th WRS at Kirland AFB, NM. Here, they continued to support world-wide nuclear debris collection requests. The now-aging fleet was experiencing wing cracks on all of their birds. We heard stories about maintenance crews stop-drilling new cracks after each sortie, and the engineers gathering to decide how much individual cracks and total cracks were permissible. This also placed limits on the amount of payload that each aircraft could carry. During this time, the 58th suffered 2 fatal accidents, neither related to wing cracks. One was a traffic pattern accident at Kirtland where the navigator ejected safely, but the pilot was killed. There was also a "Mach tuck" incident where the aircraft broke up during decent. Between the accidents, and the Air Force being unwilling to re-wing the remaining aircraft, the decision was made in 1974 to close the 58th and place the Air Force WB-57F's in flyable storage at Davis-Monthan AFB. One aircraft was transferred to NASA. The Air Staff, and the various national customers, met every year through the mid-80's to decide the long term fate of the stored aircraft. Finally, the decision was made to send a couple aircraft out to museums and to scrap the rest. 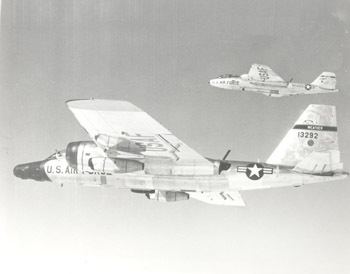 Amazingly, two WB-57F's are still flying today. NASA has flown them for years gathering high altitude research data relating to changes in the environment. They recently announced that their two WB-57F aircarft would support the Return-to-Flight program for the Space Shuttle. Information about NASA's small fleet can be found here. 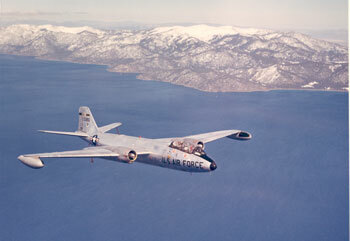 For fans of the Canberra in all her forms, check out Mark Witt's B-57 Canberra web site. For the September update, we turn to the archives of the Air Force Weather Agency at Offutt AFB, NE. These photos are all official U.S. Government property and can not be sold, copyrighted, or used for commercial purpose. Any display of these pictures should credit them as "Official Air Force photograph, courtesy of Air Force Weather History Office". WC-130B Tail No. 623494. 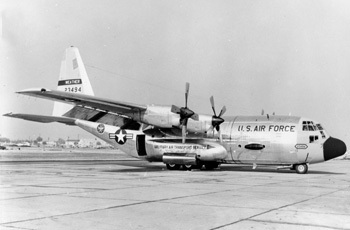 One of five C-130B's assigned to AWS during 1964. 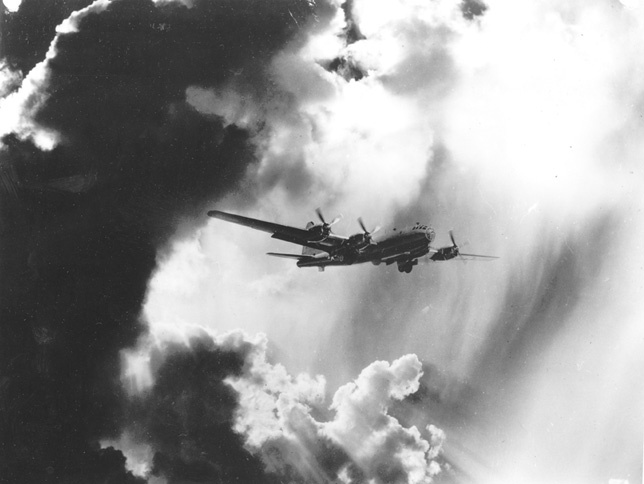 They were used for weather reconnaissance and as support aircraft during that time. The 54, 56 and 57 WRS each had one, and the 55 WRS had two, one each at McClellan and Eielson AFB. 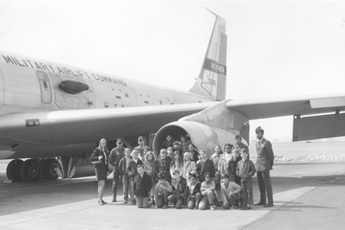 On March 16, 1971, a class from Hamura School visited the 56th WRS at Yokota AB, Japan and toured a WC-135B. Escorts are Capt Robert Marzano, ARWO; Capt Joseph Holt, Navigator; TSgt Jeffery Frank, Crew Chief; and TSgt Russell Breidinger, 56 WRS Safety NCO.